As part of Green Zone, one of our most important pieces of work was to get the help of residents to map the green spaces of the estate. We also wanted to get feedback from residents on some proposed plans for those spaces. We decided to hold an initial consultation with follow-up events, using different techniques to try to make these events as participatory as possible. We held the event in the Tenants office, and laid on cakes as an incentive and a good way of getting people to sit down and „commit‟ to the event. Large A0 maps of the estate were laid out on tables, alongside a large display of the estate‟s history. People gathered around the maps and discussed their ideas, annotating the maps, as well as drawing, writing or modelling their ideas. We asked a local resident to lead a walk around the green spaces, identifying general „areas‟, identifying plants, and discussing the way the spaces were currently managed. 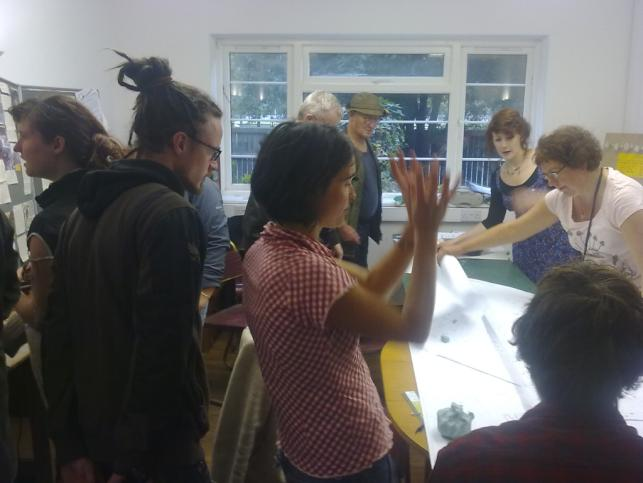 People identified areas of the green spaces that they already managed or would like to manage. This information was added to the maps, and in some cases people filled in an „adopt an area‟ sheet. Members of the community were invited to Discussing ideas around the big map fill in a sheet detailing their existing skills, whether they would consider sharing them, and listing any further skills they would like to learn. This information went towards collating a „yellow pages‟ type booklet. It also gave us further ideas of what people would like to learn, and helped us plan courses and sessions for residents. There was a really positive atmosphere and lots of discussion and chat between all attendees. The large maps worked really well. 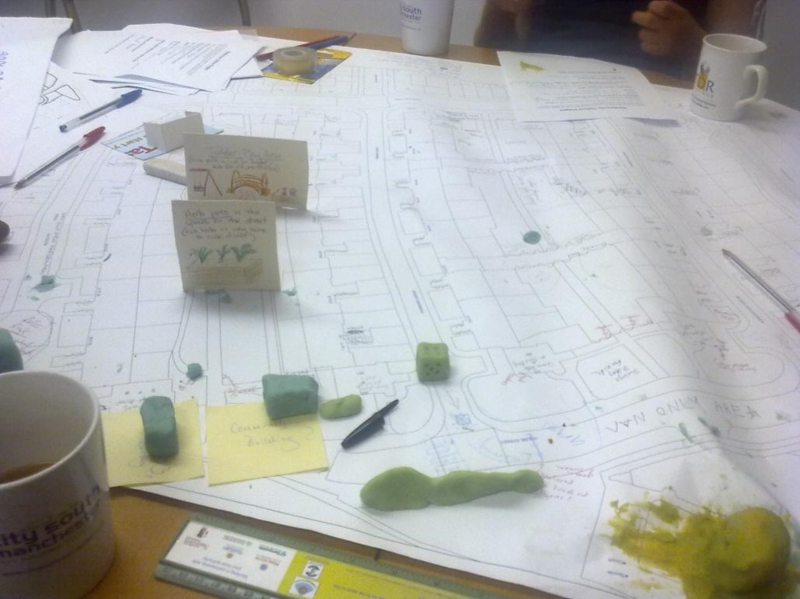 We‟d supplied pens, plasticine, and other objects to make the mapping three-dimensional. We also supplied post-it notes for people who preferred to write their ideas down. Altogether, people were really creative in the way that they added their ideas. While we were on hand to encourage people, the mapping activity was very self-directed. Giving the residents control over the mapping exercise meant that people felt they were really being listened to and included. This did mean that we didn‟t cover everything that we had envisaged. However, the event would not have worked so well if we had pushed an „agenda‟. drawing stuff and kids were there. For people who couldn‟t stay, or who didn‟t feel comfortable at a big event, we had smaller maps and sheets for them to take, so that when they popped by, they still felt like we wanted their input. Follow up Events We ran drop-in sessions over the next few weeks and a number of people who had not been able to make the initial event popped by to add their ideas to the map. We also held a couple of larger follow-up events. For these we created a large display consisting of different sheets that represented ideas that people had shared with us using the maps. We took photos of areas of the estate and Kate drew on the suggested ideas in coloured pencils and felt tip. The effect was pleasing and there was a lot of positive feedback for this creative way of visualising changes. These sheets were laminated and spaces were designated on them for people to put a sticker to show support or disapproval for the idea. 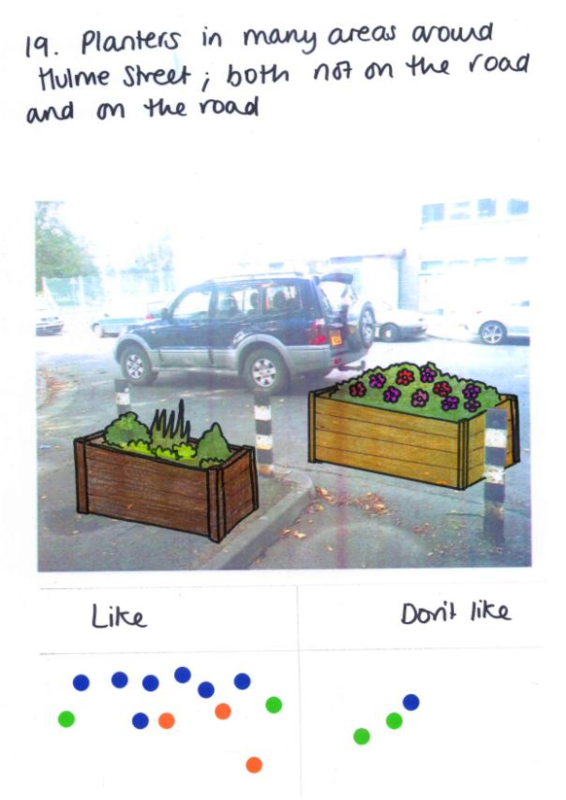 This allowed a simple, democratic and inclusive way for people to give feedback on the ideas of their neighbours. There were also slips of paper where people could describe why they disagreed with an idea or what concerns they would have. This feedback showed that while some ideas had near universal approval, others we seen to be problematic and would need more thought and consultation. We were able to work with some of the residents groups to use this information as a way of demonstrating need for some projects for which they applied for funding. In fact, these events and feedback have been the basis of three funding bids so far. Here are some pictures of the illustrated ideas sheets that were put up for people to vote on.